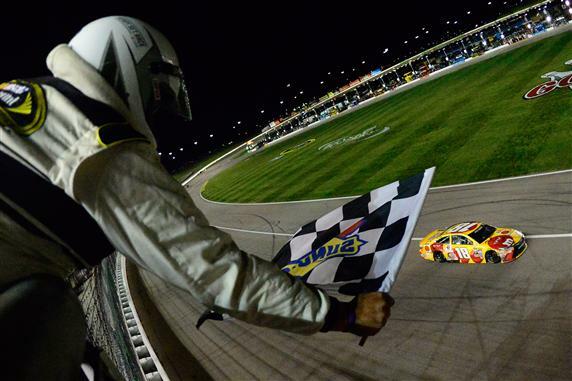 KANSAS CITY, Kan. – Kyle Busch finally overcame his gremlins at Kansas Speedway in a race that left Martin Truex Jr. overcome with frustration. 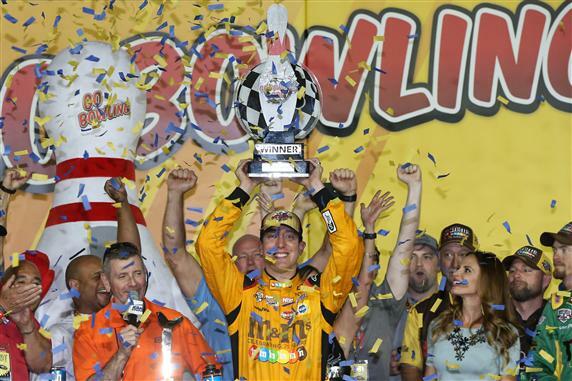 On Saturday night—in stark contrast to many of his prior misadventures at the 1.5-mile track—Busch waited until after the Go Bowling 400 to destroy his No. 18 Joe Gibbs Racing Toyota, a feat he accomplished during his celebratory burnout. Busch took the lead for good on Lap 231 of 267 after Truex, who led a race-high 172 laps, brought his car back to pit road on Lap 215 because of a loose wheel, the result of a bolt that broke and prevented the tire from mounting properly during a green-flag stop three laps earlier. With the fastest car out of contention, Busch had to survive two more restarts, the first on lap 240 and the second nine laps later after Denny Hamlin tried to thread the needle between Kyle Larson and Brad Keselowski and triggered a Lap 241 wreck in Turn 4 that ruined the chances of four strong cars—those of Hamlin, Keselowski, Larson and Joey Logano. After the race went green for the final time on Lap 249, Busch held off Kevin Harvick’s charge to win his first NASCAR Sprint Cup Series event at Kansas, his third of the season and the 37th of his career. Harvick came home second 1.112 seconds behind Busch. Kurt Busch was third, followed by Matt Kenseth and Sunoco Rookie of the Year contender Ryan Blaney, who posted a career-best finish on an open-motor track. Stevens opted to keep Busch on the track under the fifth caution on Lap 233, after Ricky Stenhouse Jr. scraped the Turn 4 wall to bring out the yellow. The choice to keep the lead and take advantage of clean air proved a wise one. “I knew our car was best out front,” said Busch, who has now won at all active Sprint Cup tracks except for Charlotte and Pocono. “I had trouble in traffic all night long. I wasn’t the best at being able to pick my way through that stuff, but when we had green flag pit stops, I really got some good holes and was able to make some good time. After qualifying 26th, Harvick’s Stewart-Haas Racing team made significant adjustments for the race. “We overhauled this thing this morning to try to get it close, and they did a great job,” Harvick said, who hit a piece of debris during the final 19-lap green-flag run. With the nose and splitter of his car damaged, Harvick suffered a tight handling condition and Busch was able to pull away. And it certainly didn’t play out the way Truex thought and hoped it would. For the eighth time in his career, Truex led more than 100 laps in a Sprint Cup race. For the last seven of those races, he has failed to win (he finished 14th). “I couldn’t believe it,” Truex said of the loose wheel that ruined his night. “I went around (Turns) 1 and 2, and I was like, ‘The wheel’s loose.’ I kept telling myself that maybe it’s not, maybe it’s just shaking because it has tape on it or something stupid. It was loose, and I knew it right away. Frustrating, but that’s how it goes. “We’re going to win races for sure. If we keep bringing cars like that, we’re going to win some. It’s frustrating when you’ve had it happen so many times in your career. I swear, you watch guys win races that don’t have the fastest car or on fuel mileage and all this stuff, and it’s like, ‘Damn, someday I’m going to get on one of those or on the other side of one of them. Truex, however, can find solace in Busch’s clear demonstration on Saturday night that luck can change for the better.